Celebrate the utility of Wash tape! Craft this beautiful heart for your special Valentine. Receiving a valentine from someone you adore is special, but when the gift is handmade, it makes the occasion truly memorable! This year, we encourage you to skip the cliche greeting cards and use your inner creativity to express how you feel. Create a Valentine's Day gift with true staying power using this helpful tutorial from our website! The Washi tape heart features a sturdy wooden base, making it ideal to use as a decorative piece or give as a gift. Add custom flair by applying decorative cut-apart paper from Graphic 45, Washi tape, and other Valentine's Day adornments. 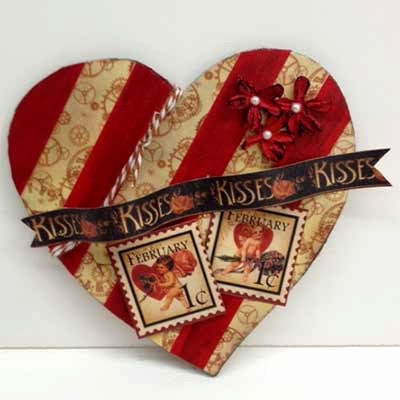 Planning to make this particular craft, or another from our How-To section, for your Valentine? Share your work with us on Facebook! An Afternoon in Paris With Le Petit Bistro!